For in Scheme 1-30 bodies to determine support reactions. The results in the load circuit have the following values: weight of the load G = 10 kN, the force F = 10 kN, the moment of couple M = 20 kN * m, the intensity of the distributed power q = 5 kN / m, and gmax = 5 kN / m. The dimensions are in meters. Body weight should be ignored .. 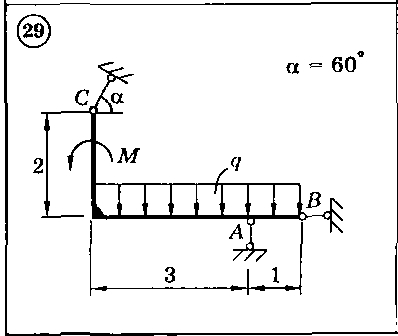 Solution of the number 29 circuit C2 "
"Right after the payment you receive a link to the archive with the solution of the problem in theoretical mechanics C2 B29 (Figure 29) in the test book" theoretical mechanics "Dievskaya VA Malyshev IA 2009 for university students. After checking the solutions I would be very grateful if you leave your positive feedback. "